Test Access Switches are also known as Test Access Switch Matrix (TASM) and Test Access Modules (TAM)) are reached via the IP network. It is feasible that all necessary staff within a company can access the units and carry out testing. The scenario shown is highly unlikely with ILEC and ISP sharing the same equipment. It is more likely they will have a duplicate set of equipment set up on the same circuits. Commonly known as the Telephone Exchange this holds all the telephony equipment and provides access to the customers copper line via a Main Distribution Frame (MDF). One Intelligent site control Manager is required per site, the capacity of the site will determine which unit should be fitted. Connection is daisy chained along to all the TAMs installed. 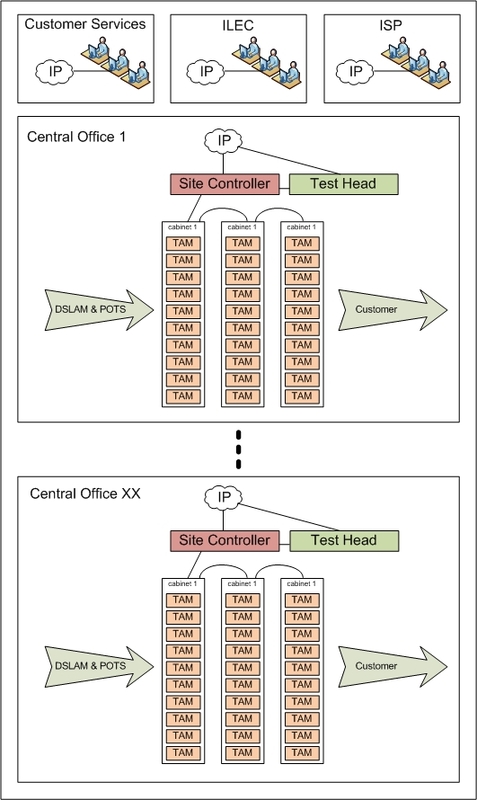 One Test head is required per site, the Test Bus is daisy chained back through each TAM to the ISMC and then on to the Test Head. TAM is installed in racks, cabinets, wall mounted or directly to the DSLAM. It is site independent and the TAM types can be mixed and matched to the site equipment. The activation of the Test Access Module is normally integrated into the service providers management system. The user may enter just the customers phone number and the system will translate this to a Central Office, Rack, TAM and pair on the TAM. This line circuit is then connected back to the Test Head and a test carried out as required. The test results will then appear on the users screen in an easy to read and understand format. The user requires no detailed knowledge of Telecoms or networks and can initiate the appropriate team to fix any fault found. The modular design of the system allows easy expansion and growth as the customer base grows. TAM modules can be added in stages to meet demand. The deployment and equipment cost is quickly recovered once the installation is complete. The need to send an engineer to site or a 'truck roll' is no longer necessary as access to test the line is available to anyone within the suppliers network. Security measures exist and access is managed by the service supplier. An engineer only needs to attend site if the test proves the fault to be in that location. Operational Expenditure can be reduced quickly and significantly, quicker fault diagnostics and fault repair raises customer satisfaction and improves customer loyalty. Cost is normally calculated back to a per line price for a business case or approval document. Doing this distorts the figure with small sites appearing expensive and large sites being too cheap. A certain amount of kit has to be installed at every site and is the base cost per site. The number of TAMs then fitted can be calculated across a per line basis. On average the cost can be as low as 4 Euros per line.